Are you ladies excited for Valentine’s Day that is just around the corner? I certainly am! I just love all the colors, hearts, and pink champagne. Plus, it gives me an excuse to have flowers around the house all month long! Valentine’s doesn’t just have to be about your significant other. It’s about the ones you love, including all the great GALS in your life. So I was pretty excited when Lulu*s asked me and my blogger bff, Taylor (The Little Blonde Book) to join in on their “Galentine’s” day. Get it? GALentines. 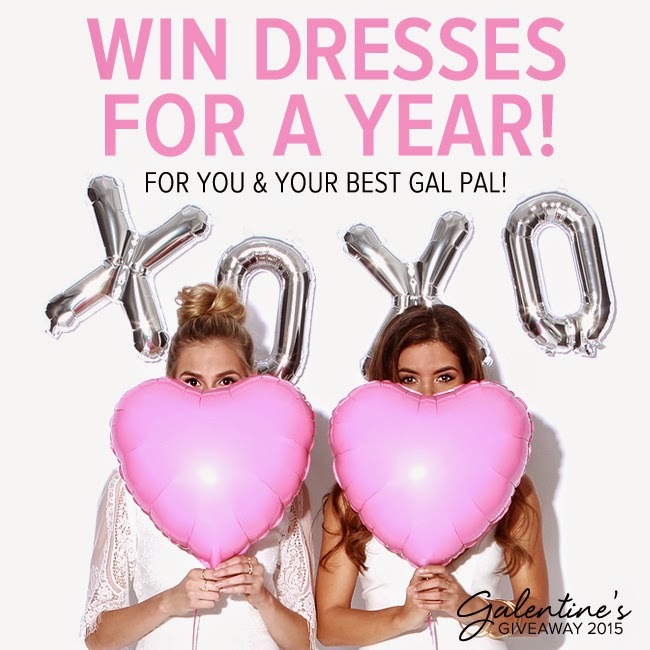 Lulu*s is giving away an entire year of free dresses to one lucky gal (and her best pal)!! Amazing or what?! Entering is super easy – see details below. You can find my pink two-piece dress here & the striped dress here. Forget the flowers, treat yourself to fab tricks for Valentine’s Day! Lulu*s is giving away an entire year of free dresses to one lucky gal (and her best pal) for all of 2015! All you have to do is subscribe to their email newsletter by entering your email address below! You’ll get a coupon code for immediate shopping upon entry and kept up to date on all the latest looks and chic styles. Want an additional entry (and a better chance to win)? Refer a friend! Thanks to Lulu*s for sponsoring this post! All opinions are my own. I love both looks! That hot pink two piece is such a fun color! I love the striped dress and moto jacket too!